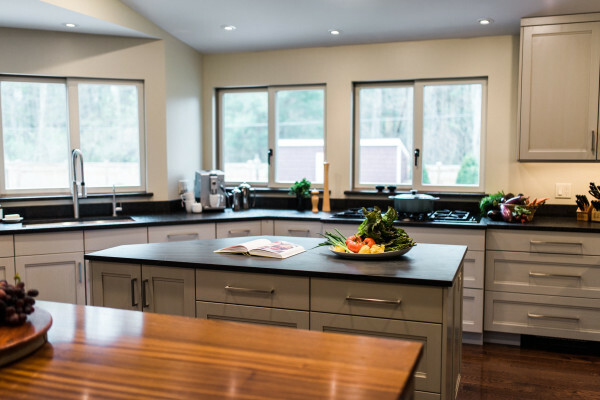 This transitional kitchen designed by Jason Henderson of ShoreHaven Kitchens has the clean lines of contemporary styles, blended with accents of the traditional, such as raised panels and natural wood. 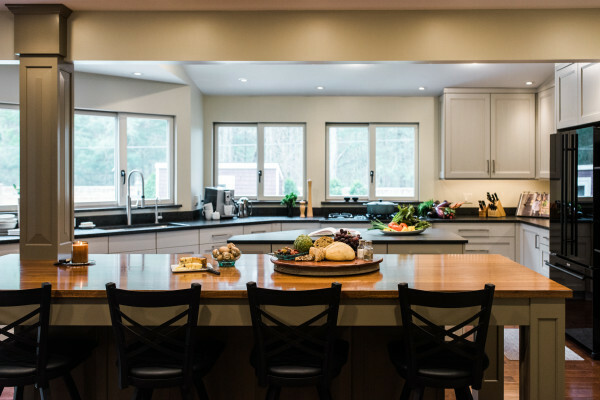 The classic features of the island offset some of the more modern details of the surrounding cabinetry and helps land this kitchen in the transitional style. 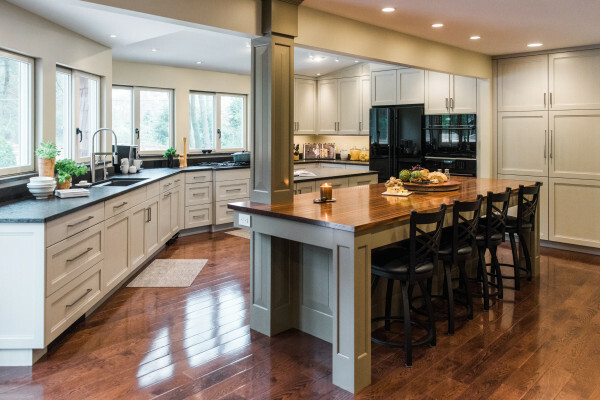 A large, open concept floor plan features both a baking and prep island as well as a wood-topped eating island that takes the place of the traditional kitchen table. 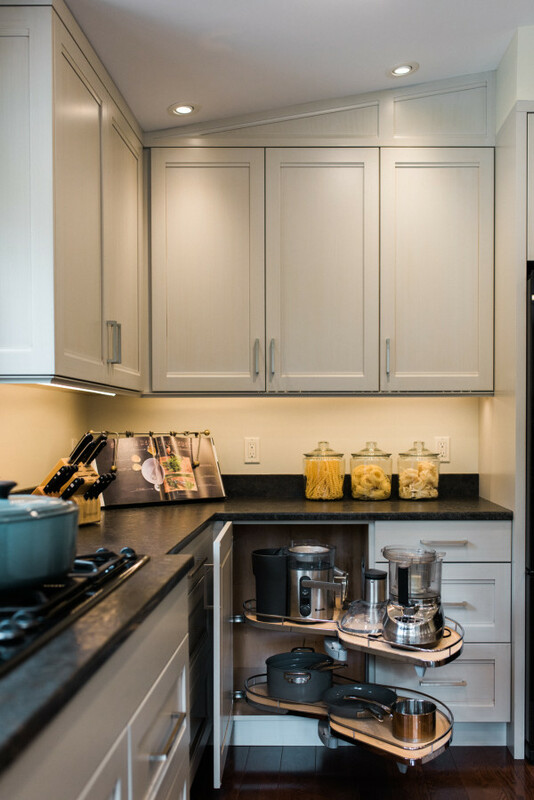 Built-in appliances, plenty of pantry space and a stand alone bar opposite the kitchen area make this kitchen well equipped to store everything out of sight and keep prep work for entertaining to a minimum. 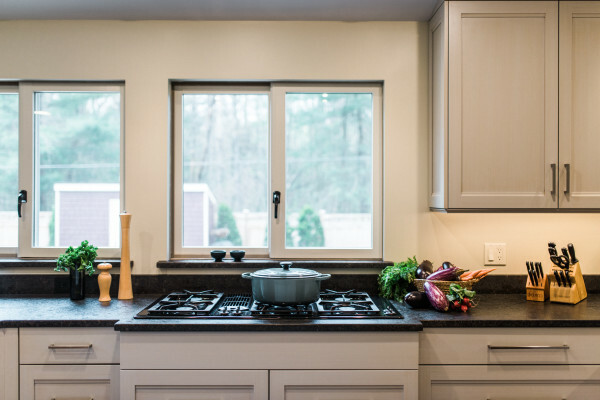 With no shortage of natural light from the window wall above the sink and cooktop, and the addition of recessed ceiling lights, the homeowners opted to forgo any hanging light fixtures to keep the space open and airy. 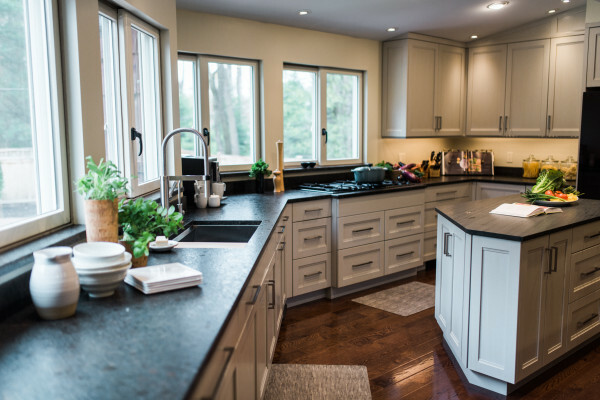 Soft grays and warm wood tones balance perfectly and keep the kitchen feeling comfortable and inviting. Open floor plan transitional kitchen layout. Sheetrock return windows offer plenty of natural light, while not distracting from the simplicity of the cabinetry. 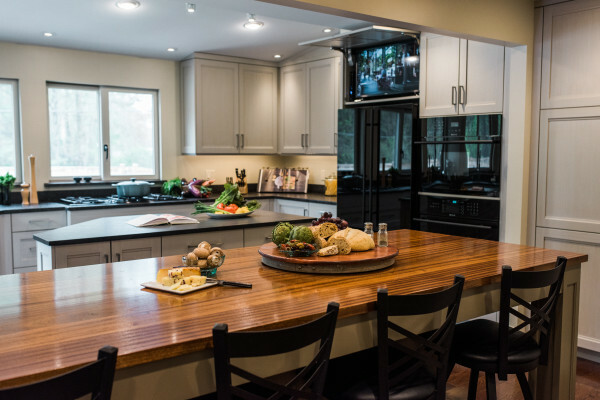 Double islands allow separation between the eating and cooking areas. A powerful down-draft hood takes the place of a traditional hood above. 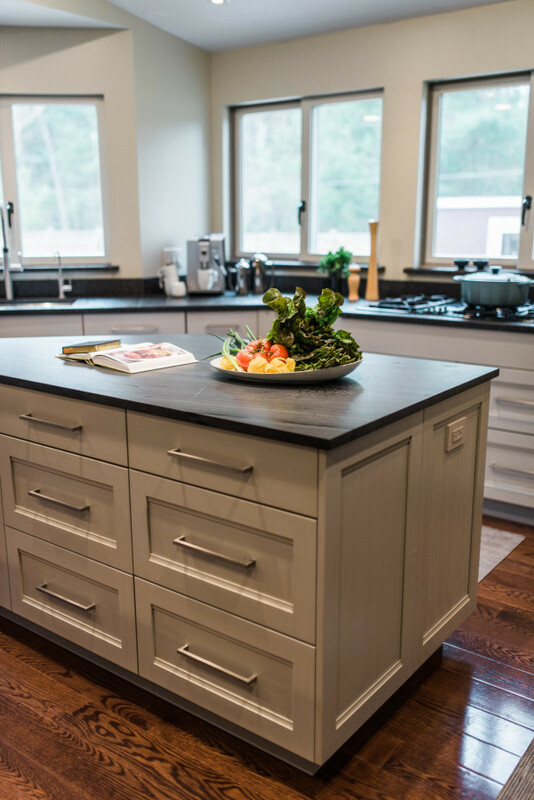 The slate-topped prep island is perfect for baking and meal preparation. The television is discreetly hidden behind a tip-up door above the refrigerator. Sapele wood tops the eating island and adds a casual elegance to the unconventional dining area. Kidney shaped pull-outs make functional use out of otherwise less than desirable blind corners. 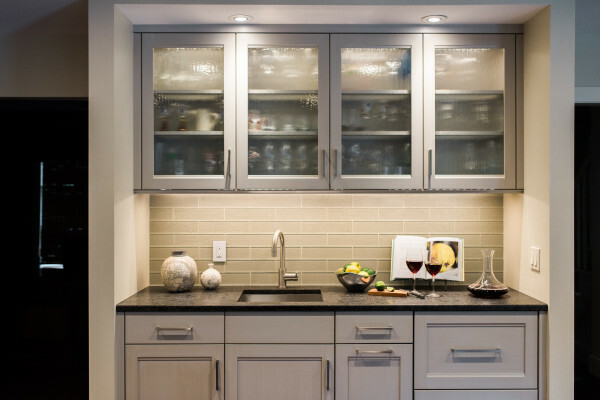 A glass tile backsplash keeps with the gray tones of the kitchen while adding an element of style. 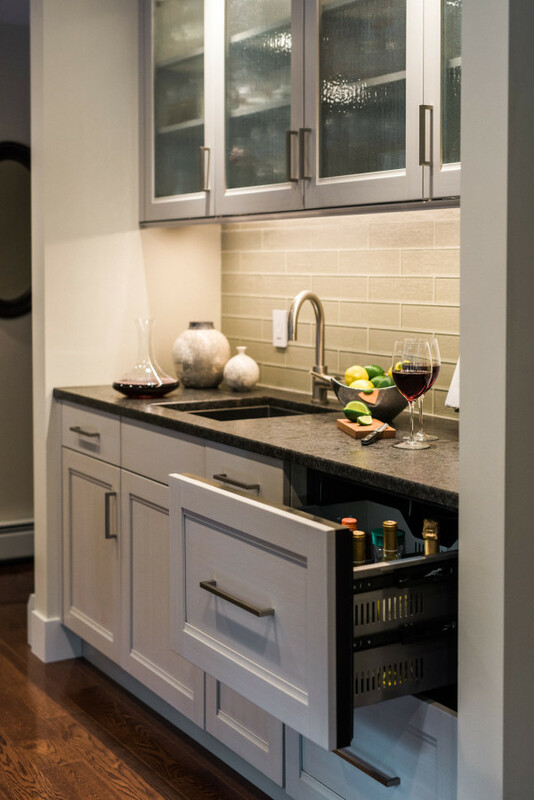 Refrigerated drawers keep bar beverages separate from the main kitchen area and are perfect for everyday entertaining.